For some reason, I continue to crave Asian flavors in Istanbul. Guess I’ve gotten over my pork craze since we have enough stocked up in our freezer. Now, trying to find/eat/make proper Asian cuisine has become my latest vice. When you can’t have something, you want it even more. 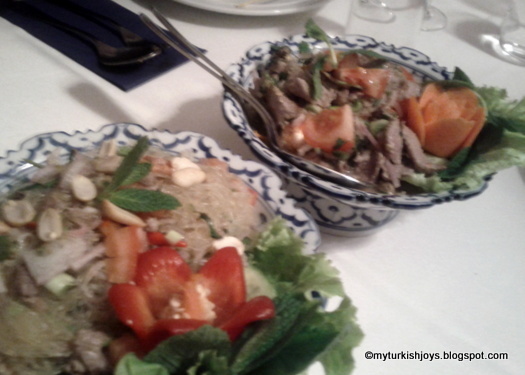 Last weekend, we met two of our good Turkish friends at Pera Thai in the Beyoğlu neighborhood. 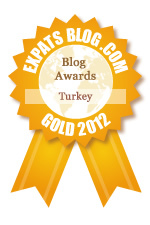 Our friends plus several expats had recommended the restaurant, so we figured it deserved a fair chance. The restaurant, open since 2001, has been awarded a Thai Select Award by the Ministry of Commerce of the Royal Thai Government. Thus, we were expecting great things. For appetizers, we chose the obvious: chicken satay. The chicken skewers were moist and the satay sauce was slightly spicy. Unfortunately, my photo was very blurry. Next up, the four of us ordered two salads to share – Yum Neua Yang, a spicy grilled sirloin beef salad, and Yum Woon Sen, a spicy glass noodle salad with our choice of pork. I couldn’t believe the flavors I tasted – lime juice, cilantro, kafir lime leaves and chilies! 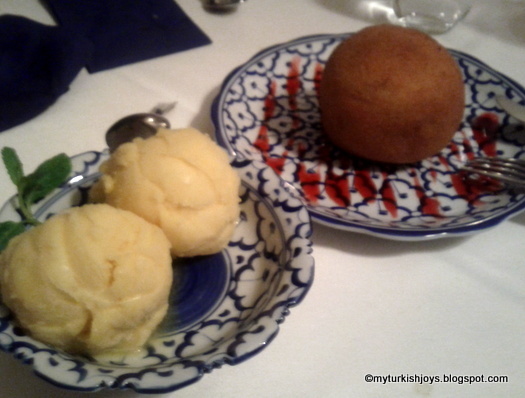 These flavors are quite rare in Istanbul. 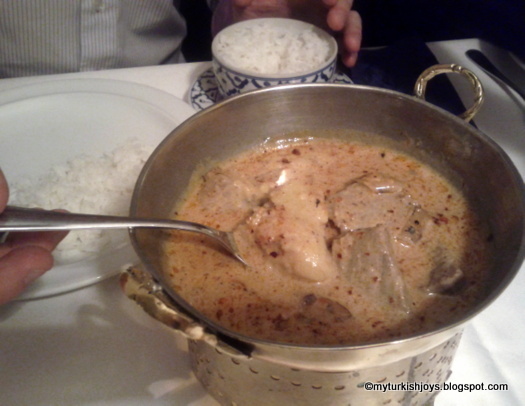 For entrees, my husband ordered Massaman Neua – beef served in a coconut milk curry with potatoes and roasted peanuts. I chose the Thai staple of chicken Pad Thai. 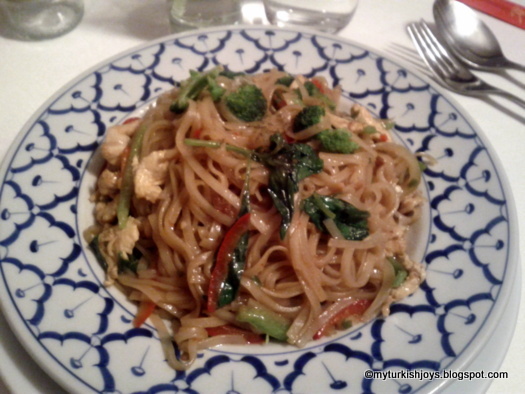 I reasoned that if a Thai restaurant can’t do a decent Pad Thai, then it’s out of my favor. Though I’ve never traveled to Thailand, I can honestly say Pera’s Pad Thai was just like the dishes I’ve had back in NYC. Highly recommended! I also had asked for the dish to be spicy. 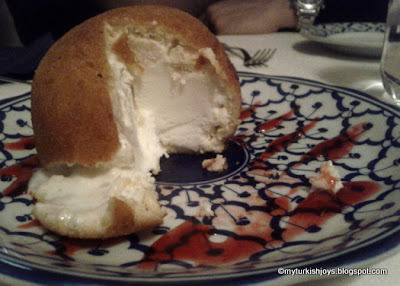 The four of us finished off our Saturday night meal with mango-passion fruit sorbet and a gigantic scoop of tempura-battered Thai fried ice cream. The sorbet was a tad icy for me, and the fried ice cream was still frozen solid in the middle. I like it when you break open the crispy shell and the inside oozes out. Of course, after eating a meal like this, we had to go dancing at a nearby small club that was spinning music from my favorite ‘80s and ‘90s. Other restaurants in Istanbul may pretend to serve authentic Thai food, but I think Pera Thai is the only one that actually delivers. we have tons of thai restaurants here and hardly any chinese anymore. i am dying to learn how to make the very best ramen. i have been doing lots of reading and hopefully will tackle it soon. @Ozlem, very yummy! I'm sure you get your fill of different cuisines back in the UK.